CHICAGO 74 • SHOPPING CENTER BUSINESS • October 2018 wrapping up development of the $200 million Mellody Farm project. Anchor tenants include Whole Foods Market, REI, Nordstrom Rack, HomeGoods and Barnes & Noble. As of press time, a grand opening event was scheduled for early Oc- tober, but retailers will open in phases at Mellody Farm. The 270,000-square-foot project also includes 260 luxury apart- ment units. In Joliet, 30 miles southwest of Chi- cago, Cullinan Properties is developing Rock Run Crossings, a 265-acre mixed- use property. Cullinan plans to develop retail and residential components on the site, along with office, restaurant, enter- tainment and hotel space. Tenant open- ings in Phase I are expected for fall 2020, according to Kathleen Brill, vice president and director of leasing. Tenants are increasingly gravitating to- ward mixed-use developments, she says. "Retailers have recognized the advantage of having many reasons for the customer to frequent the project other than strictly retail." FOOD FOR THOUGHT Mixed-use is the name of the game for retail projects in the downtown area as well. For example, Willis Tower is in the midst of a $500 million renovation, which includes more than 300,000 square feet of new retail, dining and entertainment space at the base of the office tower on Wacker Drive. Recently unveiled plans include "Cata- log," a five-story dining and retail concept anchored by food hall operator Urbans- pace. The name Catalog is a nod to Sears Roebuck Co., which originally developed and opened Willis Tower in 1973. Cata- log is expected to open to the public in mid-2020. Another new food hall in the works is Time Out Market Chicago, located in the Fulton Market District. Slated to open in 2019, the three-story food hall will encompass approximately 45,000 square feet. Plans call for 16 restaurants, three bars, 600 seats, a demonstration kitchen and terrace. Media and entertainment business Time Out Group now has several name-branded food halls worldwide. "Food halls aren't just a retail trend," writes Garrick Brown, vice president and head of retail research for Cushman & Wakefield, in the brokerage firm's 2018 food halls report. "They have emerged as the ultimate amenity for mixed-use, office and multifamily projects." 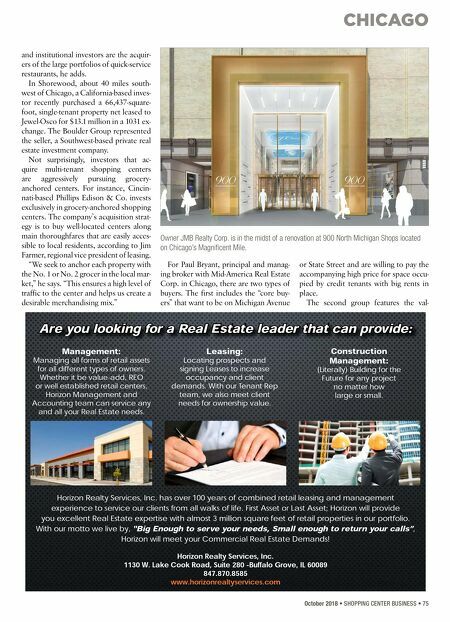 MAG MILE HAPPENINGS Owner JMB Realty Corp. is in the midst of a renovation at 900 North Michigan Shops located on Chicago's Magnificent Mile, one of the nation's most famous shopping districts. Plans call for the addi- tion of Aster Hall, a 16-station food hall from Hogsalt restaurant group. The space will feature brands such as Small Cheval, Green Street Smoked Meats, 3 Greens Market, Gilt Bar and High Five Ramen, according to the Chicago Tribune. The Magnificent Mile is slated to lose two big-name retailers. Forever 21 will vacate a two-story space at 540 N. Mich- igan Ave. and the building's landlord, Macerich, is seeking office tenants to fill the second-floor portion of the space, ac- cording to Crain's Chicago Business. The decision is likely a result of weakened consumer spending within second-floor space. Tommy Bahama is closing its 3,800-square-foot store at 664 N. Mich- igan Ave. and plans to sublease the space until its lease expires in May 2023. "Retail is changing and so are the spac- es," says Rob Bond, co-founder and pres- ident of Chicago-based Bond Cos. The consensus among sources is that stores that have recently closed either occupied too much square footage or never invested in their space. Bond says that Toys 'R' Us and Bon-Ton were over- leveraged companies. "The retailers that invest in their stores, operations and experiences are the stores that you want to have in your portfolio," he emphasizes. RECIPE FOR A SALE Beyond engaging in mixed-use develop- ment, landlords are also securing tenants that either create experiences, provide services or are internet-resistant. Buyers are looking for service-oriented tenants or medical practices, according to Brian Par- macek, first vice president of investments and director of the national retail group for Marcus & Millichap. This includes grocery stores, fast food restaurants or doctors' offices. "Single-tenant, net-leased properties remain the choice of many buyers at cap rates that typically average in the 5 to 6 percent range," he says. In general, pow- er centers without a grocery tenant are slower to trade at cap rates in the mid-8 percent range. 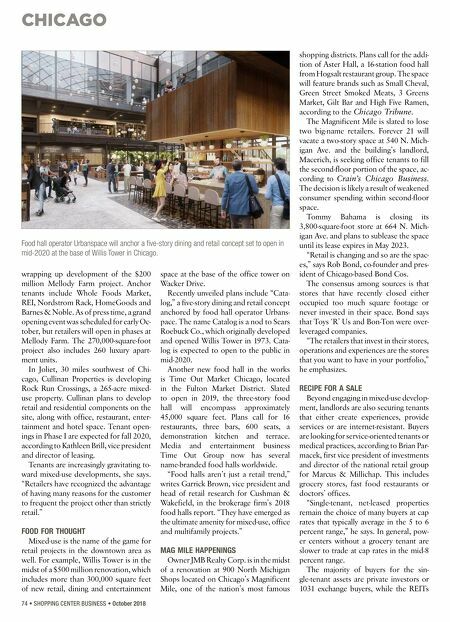 The majority of buyers for the sin- gle-tenant assets are private investors or 1031 exchange buyers, while the REITs Food hall operator Urbanspace will anchor a five-story dining and retail concept set to open in mid-2020 at the base of Willis Tower in Chicago.